EDITOR'S NOTE: Thank you to everyone who voted in the 2018 Fan Showdown. Unfortunately, due to fraudulent voting activity, we have suspended the contest at this time. We will continue our search for the fiercest fandom at a later date. Only Harry Styles' Stylers, Ally Brooke's Allynizers, Zayn's Zqad, and Justin Timberlake's TN Kids are still standing. Who will survive the second round? The battle continues now. 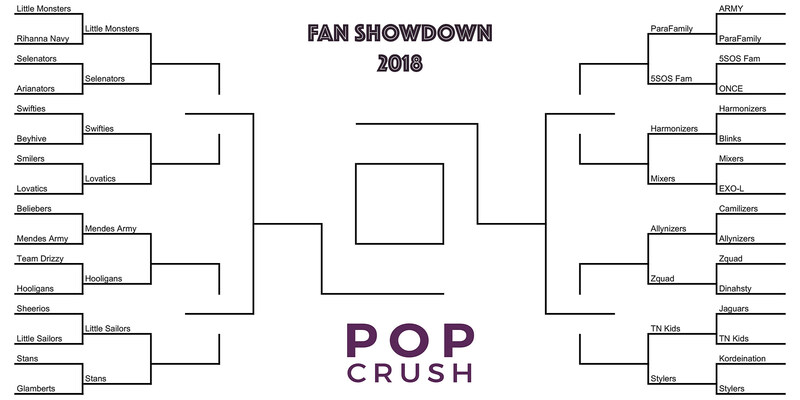 Round 2 of the competition begins Wednesday, April 11, and ends on April 16 at noon; Round 3 begins April 17 at noon and ends April 22 at noon; the Final Four begins April 23 at noon and ends on April 25 at noon; and the winner of the final showdown will be revealed on May 1. You can view the full bracket here and vote in the former group member quadrant below.